Description Beginning in the 1820s, the academy in Düsseldorf, a town on the Rhine River, began to attract artists from other German cities and from abroad. 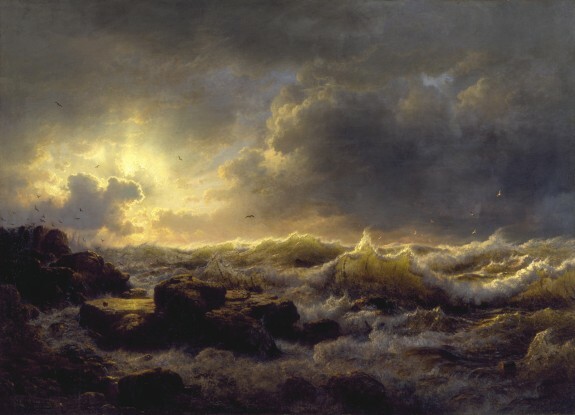 Achenbach, one of Düsseldorf's most influential painters in the mid-19th century, specialized in the "sublime" mode of landscape painting, in which man is dwarfed by nature's might and fury. At the left the evening sunlight breaks through the stormy sky to illuminate the turbulent sea breaking against the rocky coast. Seagulls struggle to fly in the violent wind. The only signs of human presence are a spar embedded in the rocks, a wooden keg adrift at the right, and a barely discernible flag. The tattered American flag on the rocks in the foreground implies that there is a shipwreck just out of view. German 19th Century Paintings and Drawings. The Walters Art Gallery, Baltimore. 1983. Savings Bank of Baltimore Special Display. The Savings Bank of Baltimore, Baltimore. 1984. Art and the Empire City: New York, 1825-1861. The Metropolitan Museum of Art, New York. 2000-2001. Provenance The Düsseldorf Gallery, New York [John Godfrey Boker, proprietor], 1849-1857; Cosmopolitan Art Association of Sandusky, Ohio, 1857-1862 [mode of acquisition unknown]; John Wolfe [date and mode of acquisition unknown]; John Wolfe Sale, New York, 1882, no. 91; William T. Walters, Baltimore, 1882, by purchase; Henry Walters, Baltimore, 1894, by inheritance; Walters Art Museum, 1931, by bequest.